The first thing to report on is just how pretty the car is in the metal. It achieves that rare trick of combining delicate, almost cute, features within a brawny, muscular package. 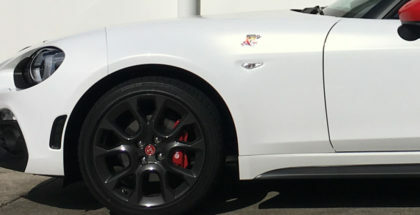 For example, it has very clear references to the original and very pretty 124 Spider around the nose, while there is a very mustang-esque butchness to the rear haunches. Of course, The styling of any two seater sportscar is of absolute importance – you’ve got to look good while you’re having fun. 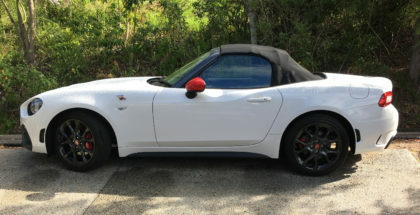 But with the 124 there is another reason why the body design needed to be particularly well resolved: it needs to stand out from its stablemate the Mazda MX5. 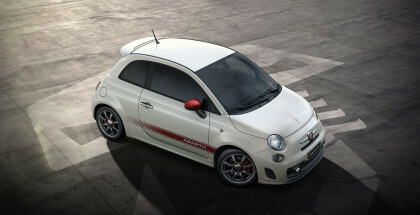 And, you have to say, Fiat’s design team has nailed it. 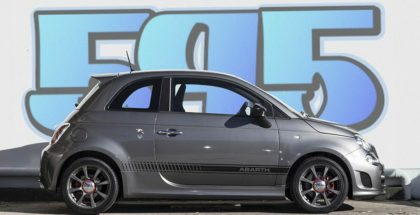 Behind the wheel the little Abarth doesn’t disappoint. As soon as you sink low into the cockpit you feel you are in something special and the raspy exhaust tone as you fire up confirms it. A full test is coming soon – if we can stop driving it for long enough to write something!